Posted on 12, January 2018 by EuropaWire PR Editors | This entry was posted in Environment, Germany, Marketing, Technology and tagged AirPollution, AirQuality, Bosch, CES® 2018, Climate, Climo, IoT, measures air quality, micro-climate monitoring system, Mike Mansuetti. Bookmark the permalink. LAS VEGAS, NV, USA, 12-Jan-2018 — /EuropaWire/ — Thanks to smart city technology, cities can now take action on the topic of air pollution. A first step towards improving air quality is the provision and management of data. At CES 2018, Bosch is presenting its micro-climate monitoring system Climo – a new solution, which helps cities around the world manage air-quality parameters in real time and at a much lower cost than existing technologies. The tiny box enables rapid and accurate measurement of data. It has been honored with a CES 2018 Innovation Award in the Smart Cities category. During CES 2018, Climo is monitoring air quality in the city of Las Vegas. The Climo system, developed by Bosch in collaboration with Intel, enables the rapid and accurate measurement of air-quality parameters. It combines sensors and software to deliver a range of air-quality data, covering key air pollutants including: particulate matter, carbon monoxide, nitric oxide, nitrogen dioxide, sulphur dioxide and ozone. It also provides data from environmental parameters such as temperature, relative humidity, light, sound, pressure – and even pollen. Ambient air quality is a key objective for urban environmental planning. The data provided by the Climo system can be utilized by cities in a variety of proactive approaches such as traffic-flow management. It can also serve to proactively message the local population with tips and information. For example, citizens who are asthmatic or suffer from allergies can instantly know whether it is better to stay indoors or avoid a certain part of the city. It is also a source of data generation for cities to make other decisions, such as future policy and planning. In rural or park areas, the system can also provide an early warning for fires. The ability to enable micro-climate data collection comes via the connection of compact wireless sensors. Secure remote calibration and monitoring is enabled through both wireless (Wi-Fi and 3G) as well as a wired connection. The Climo system is powered with Intel IoT technologies and features cloud-based analytics, data management and visualization software. Units are pre-configured by location and can be further configured using over-the-air updates. The easy update capabilities are part of the Climo design to scale with future technologies, such as 5G, as they become available. 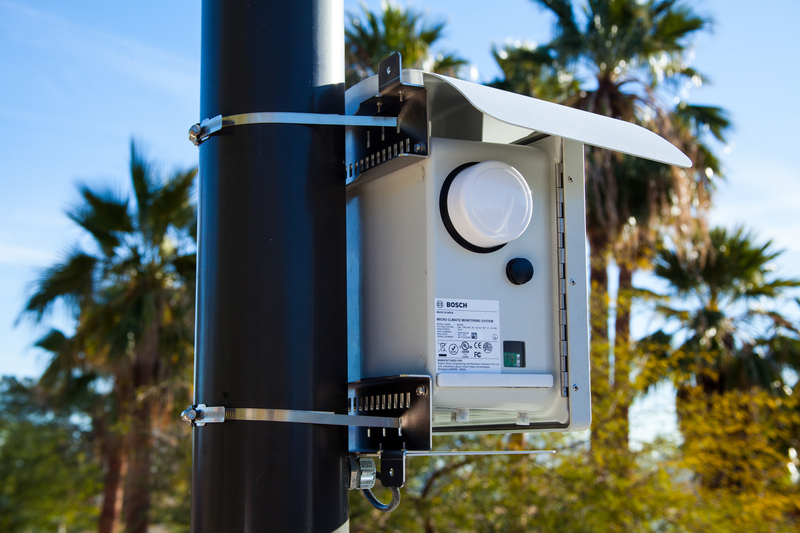 While air-quality monitoring systems can often require large infrastructure investments and are complex to operate, the Climo system was designed for simple deployment and management. It measures 1/100th the size and 1/10th the cost of a traditional air quality monitoring system. Climo was designed to withstand a variety of weather conditions. Climo units feature options for power via either 110/220 V or 12V DC. This makes it an interesting solution for cities and countries around the globe – in different weather zones and with different economic environment. Originally, it was developed by Bosch engineers in India. At CES Unveiled in Las Vegas, Bosch will present a live demonstration utilizing Climo that shows air-quality measurements from cities around the world – including Las Vegas. It will also show an updated management interface for Climo that provides an even more comprehensive view for city officials. PRESS CONFERENCE: In Ballrooms B, C, and D, Mandalay Bay Hotel, Las Vegas South Convention Center, Level 2, from 8:00 to 8:45 a.m. local time on Monday, January 8, 2018. Wednesday, January 10, 2018, 1:45–2:30 p.m. (local time) “Connected Vehicles in Connected Ecosystems” session with Mike Mansuetti, President Bosch North America, Smart Cities Conference, Westgate.